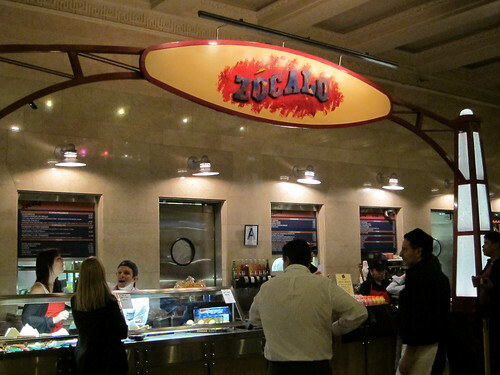 Flex Mussels might be way out of bounds and price range for us, but when we found out that their pastry chef Zac Young was doing a pop-up called Flex Donuts at Zócalo in the Grand Central Dining Concourse, I was all over that like white on rice. Until next Friday, you can get freshly made doughnuts, hopefully from Zac himself, from noon until 6pm at the take-out stand there. For $1.50 each, that doesn’t make this a bargain, it makes it a steal! The flavors each day will consist of salted cajeta (goat’s milk caramel), raspberry, spiced chocolate, and cinnamon sugar, with two additional surprise flavors. Yesterday one of those flavors was churros! 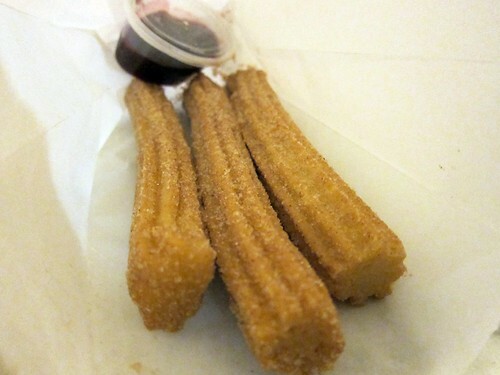 It came with a little pot of raspberry jam, but who cares about that-I got fresh, cakey, cinnamon sugar covering by Chef Young himself, $3 churros in Midtown! I love surprises that involve delicious food. For my actual doughnut (I couldn’t go there and not get a doughnut) I chose the spiced chocolate filling. Like the churros, the doughnut was freshly-made and wonderfully fluffy. 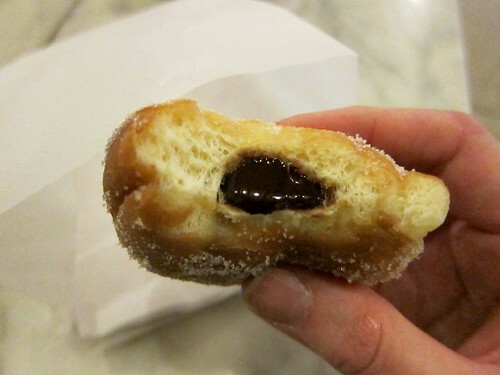 The filling is warmed up and placed inside the doughnut upon ordering, so your first bite will instantly reveal a pool of melted chocolate in the middle. The spicy quality is subtle, yet noticeable, and makes for a different doughnut experience. At $1.50, it’s one of the best cheap experiences you can get in Midtown for the next week and a half. Posted by Blondie at 1:30 pm, January 26th, 2011 under Flex Donuts Pop Up. Anyone have a recommendation for a good donut around mid-town East in the 40′s or 50′s? Joe’s in grand central station carry doughnut plant doughnuts, prolly the best doughnuts ever made. I went yesterday after work and they were totally sold out… Going to try earlier today. $1.50 for one donut would not be considered a ‘steal’ anywhere but in NYC, even for a very good donut. Then again, this is the place where people will fork over $1 for a quarter-sized cupcake.